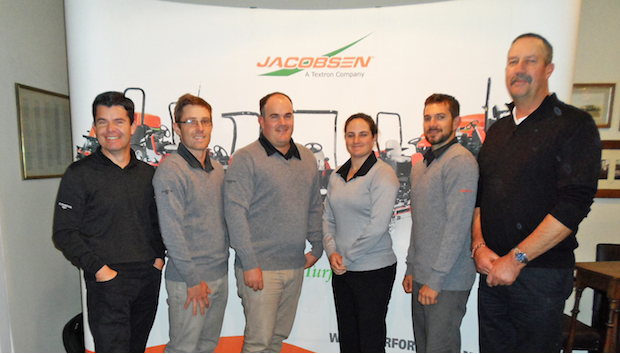 The NZGCSA, in conjunction with Jacobsen and their distributor, Power Turf New Zealand Ltd, held their latest Future Turf Managers’ Initiative at The Royal Wellington Golf Club. This two-day educational event is aimed at up and coming greenkeepers who are focused on making the career leap to Superintendent or Course Manager. Focusing on personal and professional development, the FTMI uses the expertise of respected course managers, cross-industry training specialists and industry experts to mentor and educate the next generation of industry leaders. This year’s delegates were Wendy Horneman of Pakuranga Country Club, Adam Dyet of The Kinloch Club, Daniel Cawley of Whangarei Golf Club and Stuart Baird of Akarana Golf Club. Their mentors were of the highest calibre; Brenden Allen, Superintendent at The Hills Golf Club, home of this year’s New Zealand Open and John Spraggs, Superintendent at the host club, Royal Wellington. An intense couple of days saw the delegates focusing on human behaviour, identifying their own behavioural preferences, understanding leadership, developing strategies for motivation, conflict resolution and utilising business communication techniques. The four New Zealand delegates join a cohort of over 60 greenkeepers from around the globe, who have graduated from the Future Turf Managers Initiative over the past three years. “We had great sessions with Jan Alley, a business consultant from Auckland, and covered a lot of the people management skills that you don’t get taught elsewhere. The two mentors were brilliant; they have so much knowledge of fine turf management and were happy to answer any questions we put to them. We even had the opportunity to listen to Professor Jack Fry from Kansas State University, who Jacobsen had sponsored to deliver seminars in New Zealand, Australia, Hong Kong and Singapore.